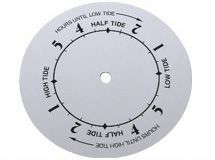 Price includes choice of an hour hand as an indicator hand, which can easily be trimmed to a shorter length, and brass mounting hardware. If you would like a different style of indicator hand, you may purchase any pair of I-shaft hands and use the hour hand (short hand) as the indicator. Hour hands are normally 2/3 the length of the corresponding minute hand.